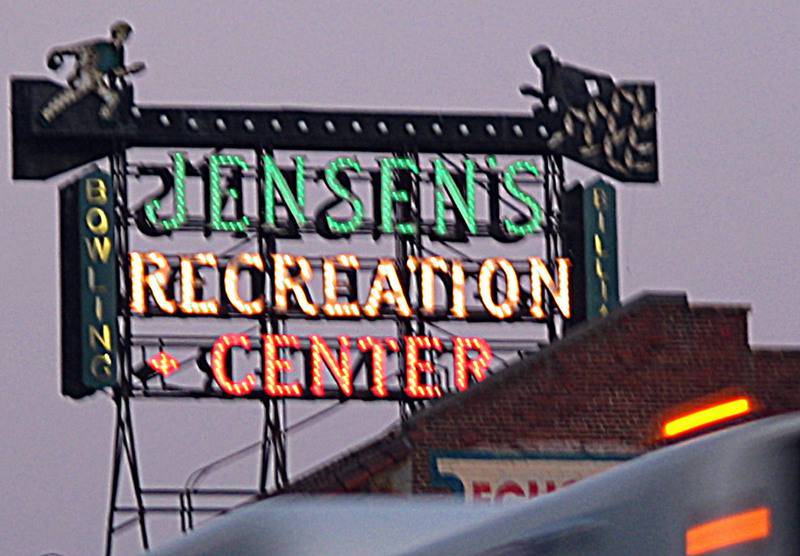 While wandering through my entirely unorganized image archives for no particular reason beyond nostalgia’s sake, I came across these snaps made during an Echo park stroll with Susan in June 2004 of the landmark Jensen’s Recreation Center sign illuminated, an occurrence that’s pretty rare these days. 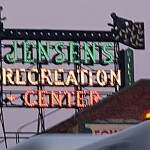 For more that 50 years, the 17′ x 28′ incandescent sign (illuminated with 1,300 red, green and white light bulbs) atop the building that depicts a bowler throwing a strike was dark. A testament to the neglect and disrepair the building and the neighborhood sometimes suffered over the years. In 1997, the sign was restored to its original appearance through a cultural affairs grant. 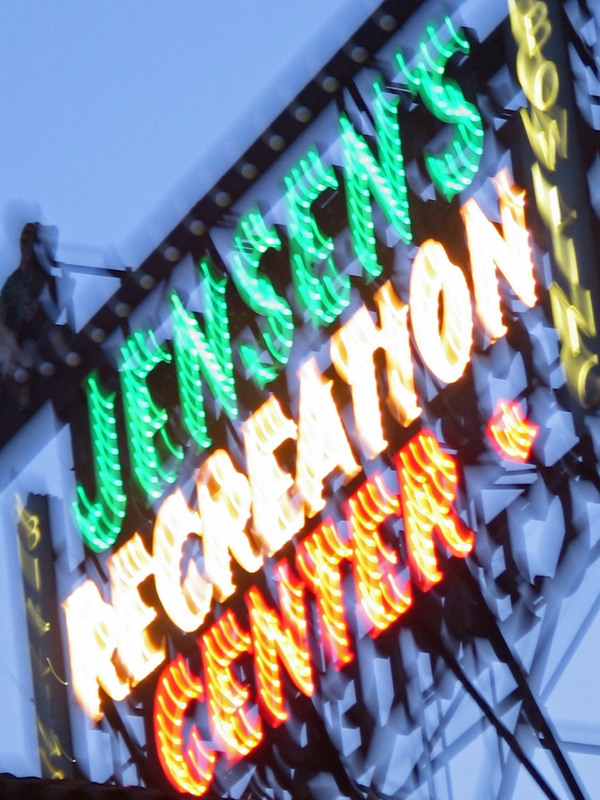 For many residents, the relighting of the sign was a momentous event that signaled the revitalization of the community and gave the neighborhood an identity. 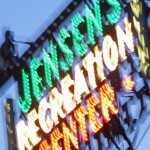 The sign’s most impressive aspect not found in these images is the animation depicting a bowler rolling a strike along the top of the sign. Those deathless herkyjerky timelapse videos I compile from my bike rides are often filled with a whole lotta nothing happening beyond a 12 frames-per-second commemoration of whatever route I’ve taken. But usually I can count on encountering something eye-catching and worth a second glance. Maybe it’s a unique pedestrian or a scenario or an architectural aspect that I’m happy to have been able to capture. 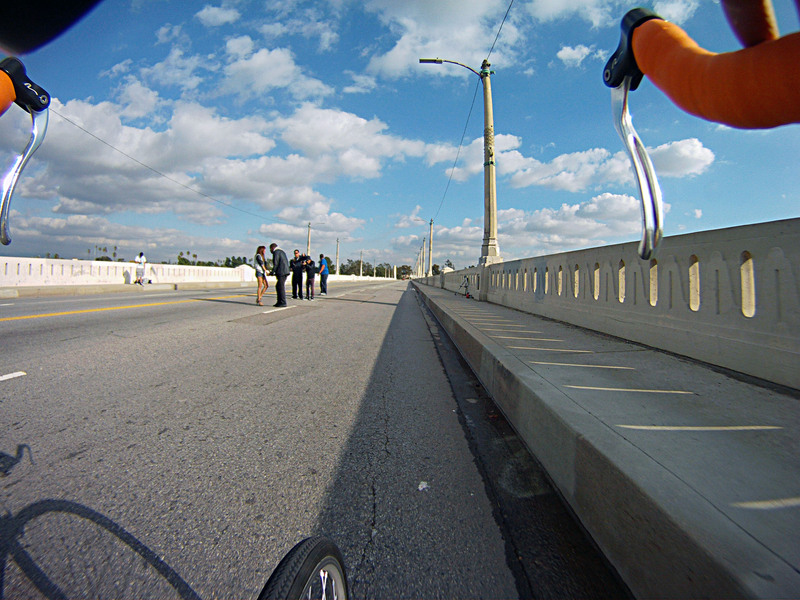 Such is the cloud-crowded frame above (cinematic, if I do say so myself; click it for the bigger picture), snapped as I was making my way east across the Sixth Street Bridge onward to Montebello for some Broguiere’s egg nog last Monday. Pedaling past these independent filmmakers during a break in the traffic flow as they rolled on a key moment between what I’d guess could be the protagonist and his or her love interest against a background of the downtown skyline. Since my approaching presence posed no danger or impediment that forced them to yell cut and flee to the sidewalks, maybe the final cut of the film will find me pedaling along the outskirts of this scene. 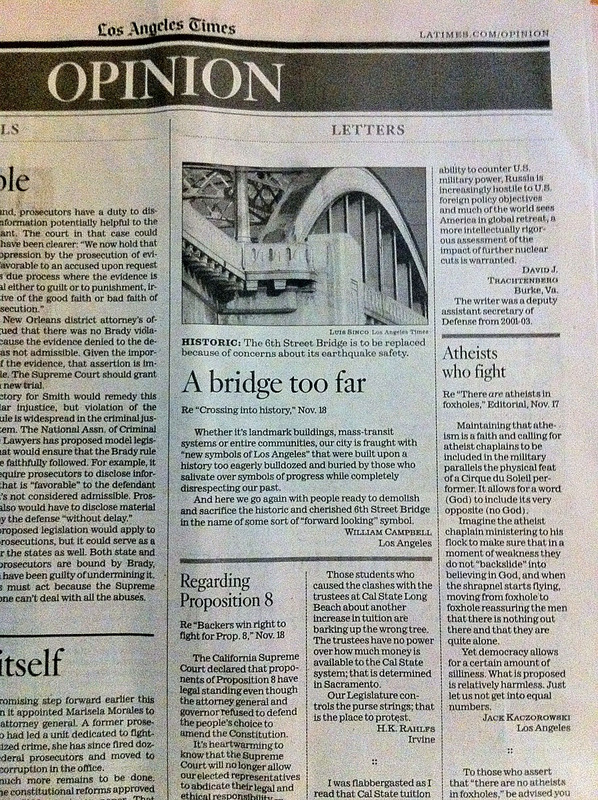 A Thursday Los Angeles Times article on the then-pending City Council vote to demolish the historic 6th Street Bridge over the Los Angeles River in favor of a replacement of more modern design, illicited a strong enough reaction to what seemed the councilmembers’ foregone conclusion that I wrote the Times a letter that morning. 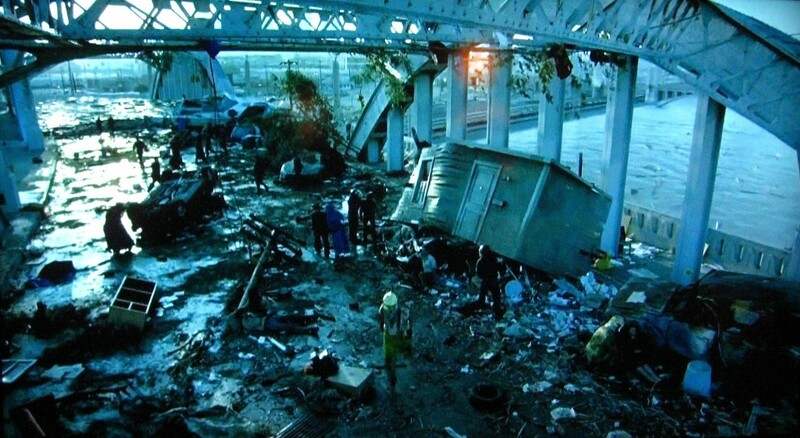 My issue is not with the bridge’s required destruction — that’s long been mandated by its increasing instability due to a chemical reaction that’s slowly decomposing its concrete. My issue is with those factions who are demanding that no aspect of the 79-year-old icon be incorporated into the new bridge, which renderings depict as having little more character than a Golden State Freeway overpass in Burbank. 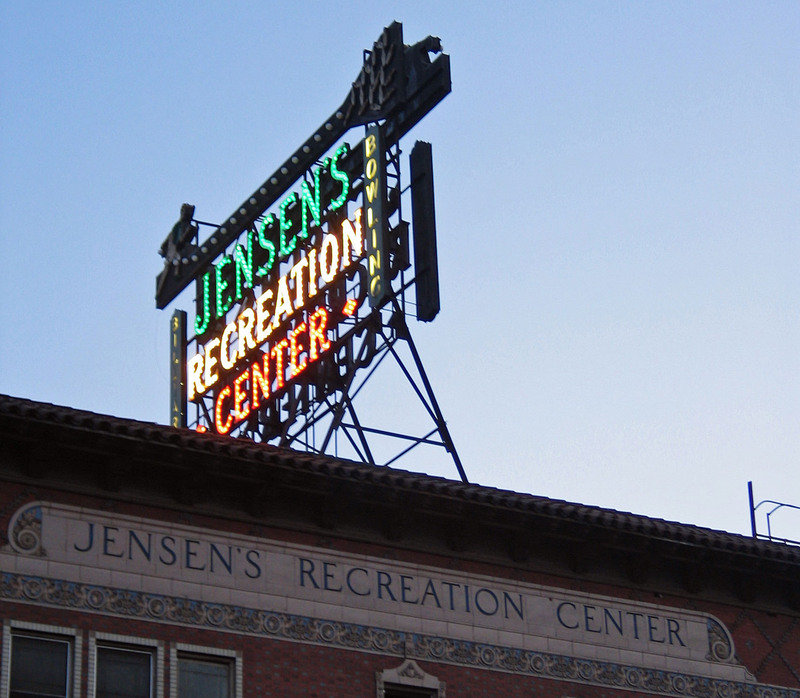 On Friday, the council — with the surprising notable exception of Tom LaBonge — did as despicably expected and decided not to remember history, but to forget about it. 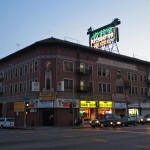 Just a companion post to redunduntally augmentalize what I tossed up on Blogging.la this morning. My 2nd-Annual March March is set for March 5 (if raining, postponed to March 12). 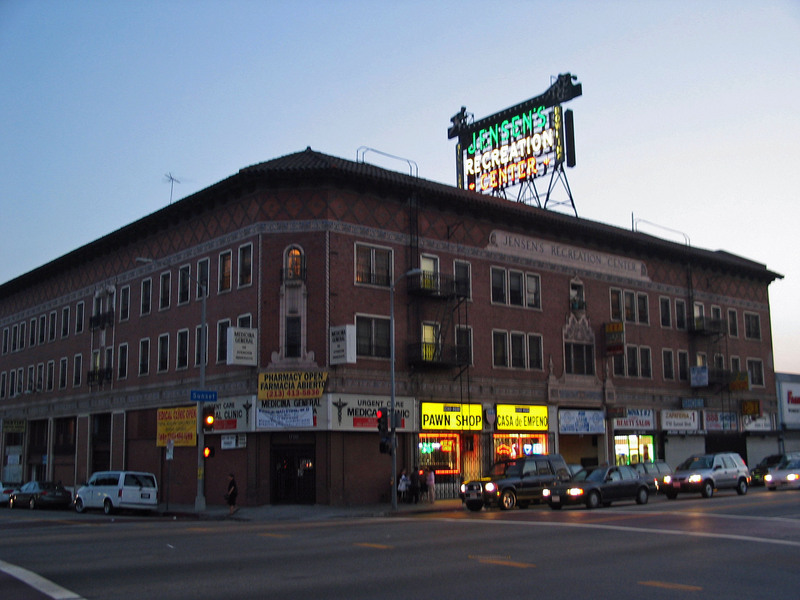 I’ll be heading east to explore the historic and amazing Whittier Boulevard. But instead of an out-and-back entirely on foot, we’ll be gathering at Union Station for a 10 a.m. departure to board the Gold Line out to East Los Angeles. Along the way we’ll be detraining at a few stations (to be determined) for quick loops around those stops. Eventually we’ll reach the end of the line at Atlantic Boulevard and from there we’ll start walking in earnest, first south to Whittier and then westward until we cross the historic 6th Street viaduct. We’ll then cut up through the Arts District and make our way into downtown and back to Union Station via Los Angeles Plaza and Olvera Street. With the Gold Line eliminating a substantial amount of mileage, this walk’s total distance will depend in part on the number of tangents we take. The main stretch back to Union Station from East Los Angeles through Boyle Heights is about 7.5 miles, so the total will probably fall somewhere between the 10- to 14-mile range. I’m betting we end up somewhere around 12 miles. Hope you can come along for the stride. You are currently browsing the archives for the landmarks category.